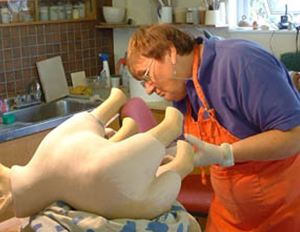 Orchard Pottery is a small studio pottery that for 38 years was the partnership of Doreen Gardner and Tony Smither. Since Doreen’s death in May 2018 Tony has continued the business with a part-time assistant. The workshop is situated in a small village in West Devon, with beautiful views of a Dartmoor tor at the head of the valley. Orchard Pottery is renowned for the design and manufacture of sculptural birds and beasts for the home and garden; there is no showroom or retail outlet. 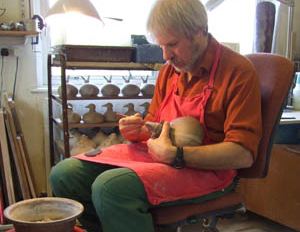 Tony works predominately in ceramics, using most of the manufacturing processes available. These include coiling, press moulding, slip casting, throwing, extruding, and slab building. On many pieces two or more techniques are employed. Recently some sculptures have been produced in cold-cast bronze resin and foundry bronze. All of the ceramic pieces are frost proof stoneware so that all of the products can be safely used in the garden all year round.